One of the commercial real estate's primary market sectors is office buildings, which can range from large multi-tenant structures in city business districts to single-tenant buildings that might be built to suit a specific lessee. What seems to be in store for office buildings in 2018? Demand for office space is driven by somewhat different factors than for other real property. Although not a raging bull, the office sector in 2018 will likely continue to benefit from asset allocations that drive incremental capital to the sector. Rents and valuations are primarily influenced by specific types of employment — those that utilize service and professional employees such as attorneys, accountants, engineers, insurance personnel, real estate brokers and related service providers (like title and escrow providers), and people working in banking, financial services, technology, consulting, medical, dental, and pharmaceutical fields. A region’s industry focus is thus key. Some tenants often have solid finances and can afford to own their own offices. Even if a business can occupy an entire building, it might still choose to lease in order to increase its operating flexibility. But, like retailers, many of these tenants view their office space as just another input in the production of their services sold from that location. In other words, the office is just a factor affecting operating expenses and revenues, and is viewed more in the context of how the location might maximize profit. For example, does the building contribute to the company’s business by allowing it to better advertise? Even if a business can occupy an entire building, it might still choose to lease in order to increase its operating flexibility; a corporate move otherwise becomes a difficult undertaking. Thus, the vast majority of office buildings are leased, and not owned. How are Office Rents Determined? Office space rents vary by locations within office properties, and owners may charge premium rents for higher floors, building corners, and spaces contiguous with elevator banks. 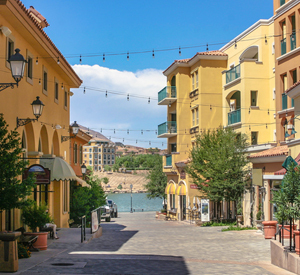 Tenants often demand special features in the leases, including rights of first refusal to rent contiguous space, signage rights, or even building purchase options. Office properties often have longer-term leases that can lag current market lease rates, so that “step-ups” (or, conceivably, step-downs) of rental rates are not infrequent when leases expire. Tenants often demand special features in the leases, including rights of first refusal, signage rights, or even building purchase options. Despite the longer lease periods, office buildings have their own set of risks. Economic downturns can affect commercial real estate — including office buildings — more than residential buildings, and businesses can go bankrupt even while people continue to need housing. After the early 2000s dot-com crash, for example, Silicon Valley rents dropped in some properties by more than 30%. For this reason, the credit quality of tenants is key; re-leases of office space can often require significant lead time to consummate. Economic downturns can affect office buildings more than residential buildings. Businesses can go bankrupt even while people continue to need housing. Because of these issues, cash-flow oriented investors try to focus on office buildings with multiple tenants, so that no single tenant vacancy jeopardizes the entire property investment. New and different employment sectors and markets are driving the current office market. The technology sector has been responsible for nearly 20% of major office leasing activity in recent years. 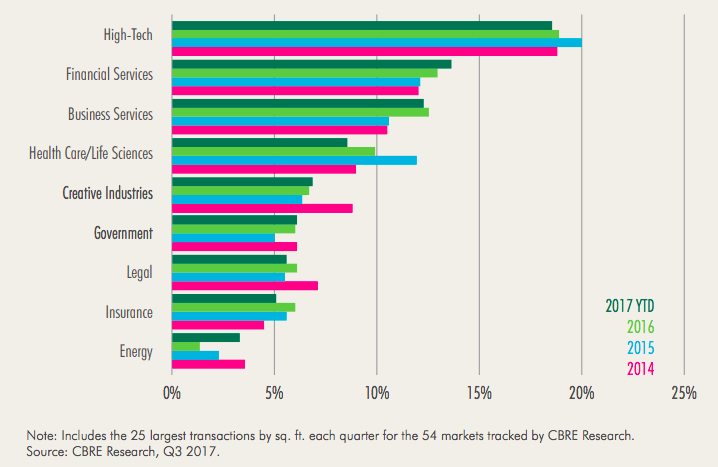 The technology sector, for example, is now a key driver of office demand; CBRE reports that the technology sector has been responsible for nearly 20% of major office leasing activity in recent years. Many market signals – such as increased employment rolls — point to a bump in office rental rates in 2018, says Bill Glazer, CEO of Philadelphia-based Keystone Property Group, a private real estate investment company that owns office and mixed-use properties along the East Coast. “When you take the sum of those macro market impacts on the office sector, it does portend for a very strong 2018, and frankly 2019,” Glazer notes. Many market signals – such as increased employment rolls — point to a bump in office rental rates in 2018. Vacancy rates stabilized from 2016 to 2017, then began to rise slightly toward the end of last year, says Peter Muoio, chief economist at Ten-X, an online real estate marketplace. 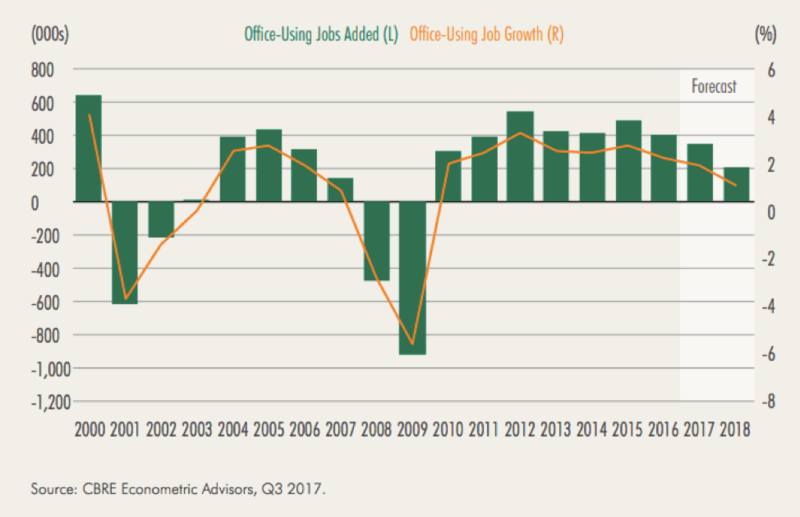 Although there is expected to be economic growth in 2018, supply is growing in the office sector, Muoio notes. This is particularly the case in stronger markets such as New York City and Houston, which saw stronger economic recovery than what Muoio describes as “left-behind” markets, where there was no substantial recovery and higher office vacancies. A lot of speculative office construction is underway, too. According to Hans Nordby, managing director with research firm CoStar Portfolio Strategy, there is 120 million sq. ft. of office space under construction in the U.S., and of that, 40 percent is still available—the highest level CoStar has recorded in the last 13 years. There is 120 million sq. ft. of office space under construction in the U.S. Of that, 40 percent is still available. According to Mr. Nordby, factors underlying the increased speculative development include cyclically low vacancy, rising demand for only class-A space and rents above replacement costs in many of the best locations. Yet this new construction seems to have been concentrated in the strongest markets; the top five markets accounted for nearly half of all underway construction on a square footage basis. Less expensive secondary markets are increasingly driving occupancy growth. Although not a raging bull, the office sector in 2018 will likely continue to benefit from asset allocations that drive incremental capital to the sector, in tandem with the recent run-up in equities and commodities. 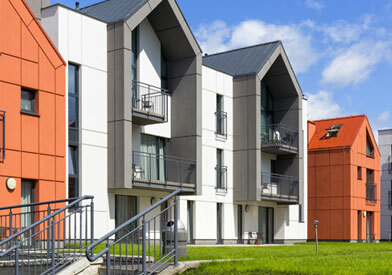 More investors may also be drawn to real estate generally as an inflation hedge, as short-term interest rates remain below GDP growth rates and inflation expectations continue to rise.